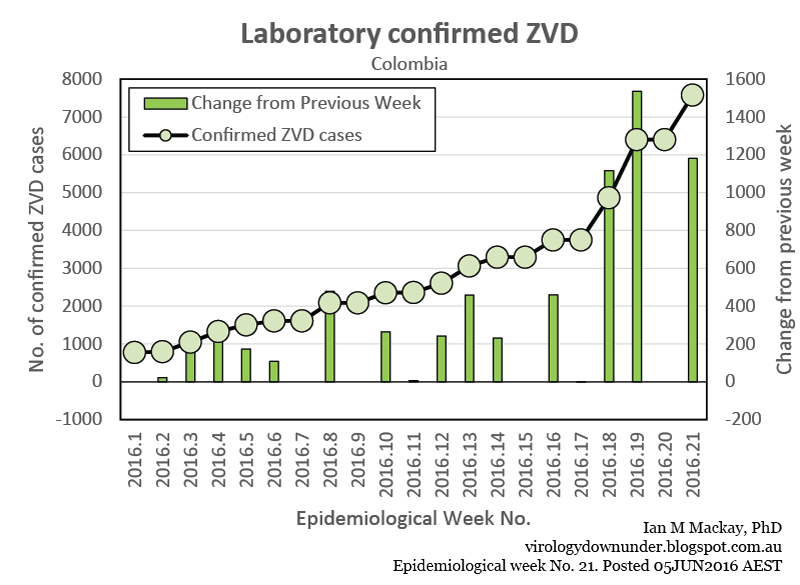 The latest epidemiological report, which includes data on Zika virus disease (ZVD; 22MAY2016-28MAY2016), has been produced by the Colombian National Institute for Health team. NOTE: While these data are from those reported the past epidemiological week, they may not be from that week. See earlier post about possible reporting lag. (green bars, right-hand axis). Data from . Graph No. 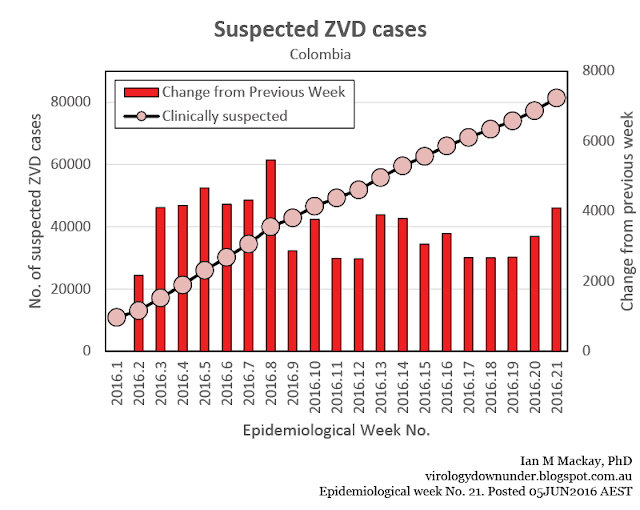 1 shows that 1,180 more laboratory confirmed cases of ZVD were reported this week than last. That's a big rise but follows a zero addition week last week. The total now rests at 7,582 or 9% (reaching the highest proportion reported to date) of all clinically suspected Zika virus (ZIKV) detections. (red bars, right-hand axis). Data from . Graph No. 2 shows the change in suspected cases. These are not laboratory confirmed. 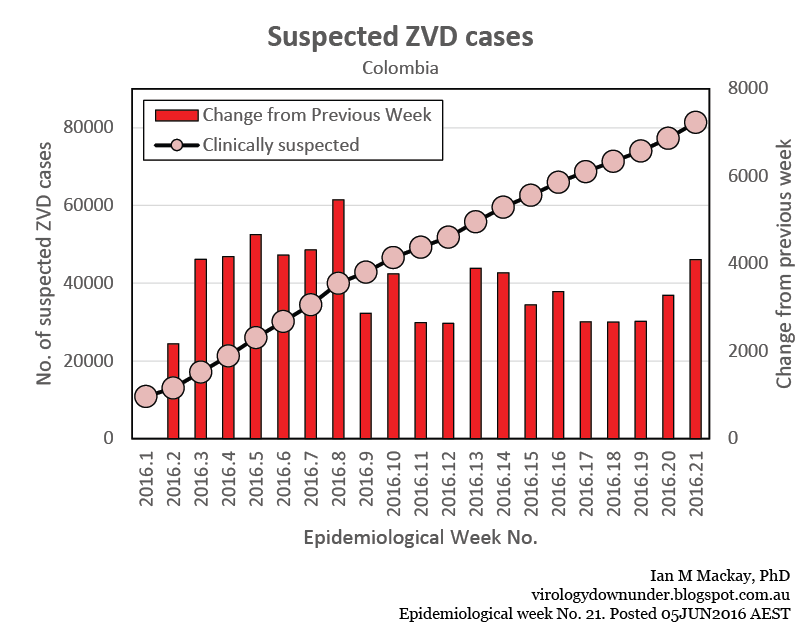 The suspected ZVD cases continue to rise in a linear fashion, adding 4,096 this week to total 81,363 suspected cases of ZVD. This is the biggest weekly rise since Week No.8. value - the y-axes now allow for negative values. Data from . Graph No. 3 shows that to Epidemiological Week No. 21, 10,419 suspected (-735 compared to last week - the biggest negative adjustment on record) and 4,891 confirmed ZIKV infections (+794 - 2nd biggest weekly rise to date) have been identified in pregnant women. As of this report, 6 (+1 from last week) live births have been diagnosed with microcephaly/central nervous system disorders and were reported as being ZIKV positive; 48 (down from 57 last week) other microcephaly diagnoses are now under investigation. 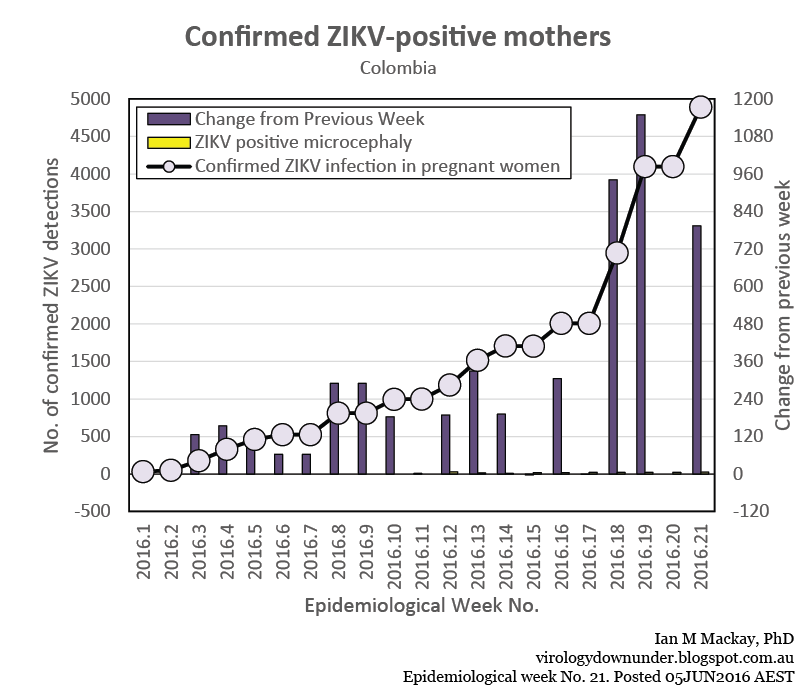 That represents 0.12% of all confirmed ZIKV positive mothers (same value for past 3 weeks). Graph No. 4 below focuses on just these positive cases. to the preceding week's total (yellow bars, left-hand axis). Data are from . 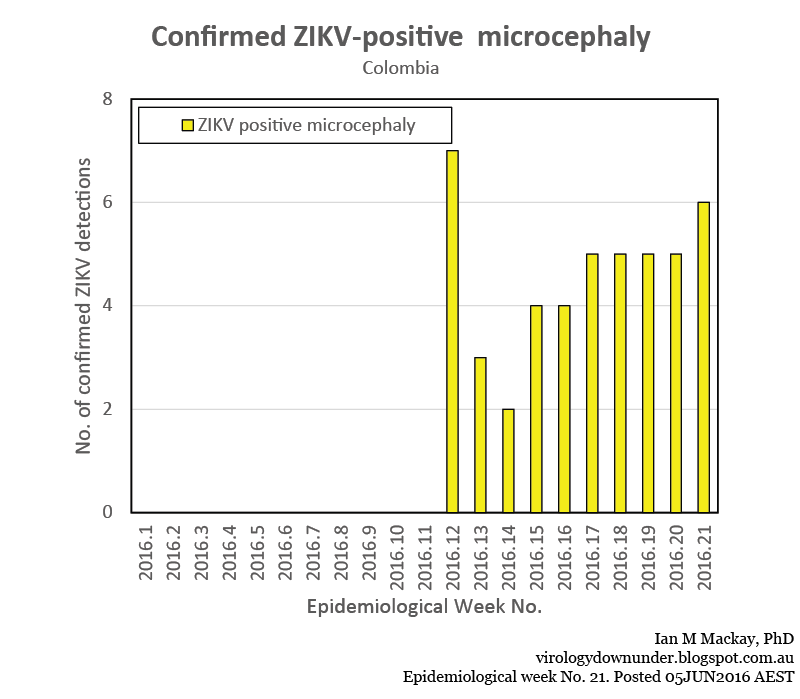 It has now been 232 days, or 7 months 19 days, since ZIKV was first confirmed in Colombia on 16th October 2015. Colombia is currently carrying the next biggest load of Zika virus disease cases, after Brazil. Keep in mind that when talking about microcephaly - we have to think back in time to what insult or infection might have occurred in the first or second trimester (probably-still not definitive). The counts of virus occurring this week will have zero impact on what happened back then. 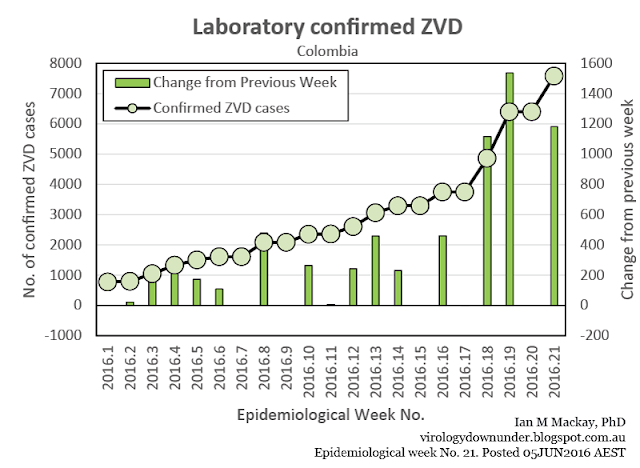 Brazil first reported reported positive (but unconfirmed) laboratory tests for Zika virus disease on 29th April 2015. Brazil then started to report a rise in foetal anomalies (an initial 141), in the form of microcephaly on 30th October 2015. This was 184 days - or about 6 months later.